Welcome to Everglades Holiday Park! Located in sunny south Florida just outside of Fort Lauderdale and Miami, our South Florida alligator park is a top attraction for locals and visitors alike. 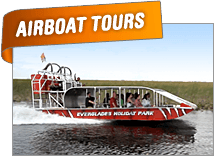 With Everglades airboat tours, live gator shows, Animal Encounters, boat rentals and more, Everglades Holiday Park is the perfect day trip for kids and adults of all ages. An Airboat Tour Through the Everglades You'll Never Forget! Climb aboard one of our state-of-the-art vessels and venture into the heart of the River of Grass for an unforgettable Everglades airboat ride, where our expert captains will take you on a narrated tour of the Everglades and show you some of Florida’s most exotic wildlife. With miles of wetlands before you, you'll journey deep into the Everglades, zipping across the "River of Grass" at top speeds, with an expert tour guide leading the way. Our fleet of airboats are spacious, safe, and offer comfort and covered protection from all weather conditions. Lock eyes with an American alligator and snap amazing pictures as you come face-to-face with some of the Everglades most unusual and exciting animals. Our Everglades airboat tours are 60-minutes long, offering plenty of time to meet some of the area's most exotic and unforgettable wildlife in their natural habitat. After your tour concludes, the excitement continues as you take in a live alligator presentation performed by the Gator Boys Alligator Rescue team here at the park. 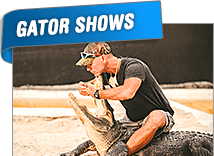 With adrenaline-charged fun, the Gator Boys and Gator Girls of Animal Planet fame delight people of all ages with exciting stunts, tricks and important information about the conservation and preservation efforts surrounding the American alligator and the wetlands they call home. Then, get up close and personal with wildlife in our Animal Encounters Program, where you will spend 45 minutes learning about, petting and interacting with some of the most interesting and exciting uncaged animals! From educational programming to exciting airboat tours, there's something for everyone at Southern Florida's Everglades Holiday Park. Our park is a great place for families and people of all ages. Your kids will love the opportunity to get up close and personal with some of the area's wildest creatures. 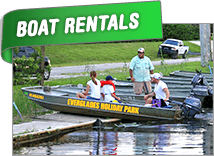 The Everglades is also great for fishing, and we can provide you with a same-day Florida fishing license, and even arrange boat rentals and guided tours that bring you to some of the best largemouth bass spots in the state. No matter where your interests lie, you'll find something to enjoy during your stay with us. Just ask the locals: they know Everglades Holiday Park is a great place to host an Everglades birthday party or corporate event. Our private airboat tours cater to parties of 2 or more. You can also customize unique shore excursions in the Everglades for your group. Additionally, we provide VIP Tour packages that include traveling arrangements to and from the park. We'll pick you up at your hotel and return you to your destination after your visit. Let us worry about the details of planning your trip! Just sit back, enjoy the ride and leave the driving to us! We offer accommodations for any group or event. Is it any wonder we've been voted one of the top three Florida attractions by readers of 10Best.com & USA TODAY and have been a TripAdvisor Certificate of Excellence winner the past several years in a row? Call us today and book the most exciting South Florida day trip! Everglades Holiday Park is conveniently located just a short drive from downtown Fort Lauderdale, making it an easy day trip both from there and from the Miami Metro area. We're open seven days a week, with tours beginning at 9am and continuing until 5:00PM. To make the most of your visit, we recommend getting here early and taking advantage of all that our park has to offer. There's no better way to see the Everglades than on our airboat tours, and there's no better place to do so than at Everglades Holiday Park.